This article is written by me(Vinesh Balan), a Keralite living in the district Ernakulam, which is also threatened to be flooded if the disaster happens. This article might be biased to the thoughts of Keralites, so if you disagree, leave a comment sharing your thoughts. "Where can I learn to swim?" that was a question that made a roar of laughter burst out. But what's so funny in it? The situation made it funny(ironic). We were having our lunch in the office, and the talk for the day was - What if Mullaperiyar dam breaks down. The responses were overwhelming, here are a few. 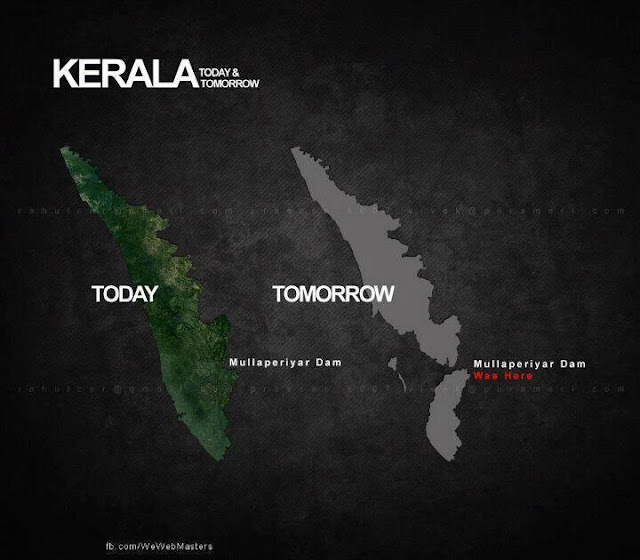 - It'll take 2 hours to reach here(the water to reach Ernakulam Dist. ), start the bike and scorch off to Kalady(which supposedly won't be flooded). - It would be fun! Everyone would be happy because all would be dying! These are a very few. I would love to compile a whole section of Mullaperiyar Jokes in future. Well, my doubt it, if the situation is so threatening, why is common man taking it lightly? First of all, this Dam shouldnt have been there. The then King of Travancore was forced to sign this barbarian unilateral Agreement which he signed saying "I SIGN THIS WITH THE BLOOD OF MY HEART". This diversion of water has caused serious ecological issues which has destroyed the entire inland fishing and Rice cultivation of Central Travancore. Because of Saline water 10s of 1000s of hectors of land is left uncultivated for decades and we Keralites now have to depend on others for our daily needs. Huge Costal Dam called Thanneer Mukkam Bund was constructed to prevent Saline water, but in vain. Tamils get this water for free and we get nothing back. For all the goods and services we have to pay the Tamils merchant rates but We have to live in fear of our entire civilization being wiped of the surface of earth. We get no money, not even the lost UN Carbon Credits worth 13.8Crores per year. We feed them through 7 Dams and they bite those feeding hands. This Dam should be and will be demolished, a new one will be constructed. Kerala, There is no going back. This is the matter of life and death for us and this is a war which we cannot lose. Water is our only natural resource and we cannot trade it for humiliation. India gained independence in 1947, but Kerala hasnt. Our resources are taken away and we get a big FAT NOTHING. Wake up or we perish. All the 7Water treaties will need to be reworked every 5 years and water will be traded, not given for charity. No more undue benefits. Tamils have shown their true colours many times. We shoudnt go back even a step. No irrational assurances to any one for the sake of our children and our future generations. Boycott all those TN produce. Stop using Aircel, Sun/Surya Network, Ban all Tamil Channels and Ban all Tamil movies from being screened in Kerala. Blockade all TN Border Check Posts. Let us see where will they sell their Beef, Chicken, Egg and Veg ? We will never back down, for it is our land our rivers and our water. TN will have to pay 138 Crores immediately for the Lost carbon credits for the past decade. Make no mistake for our Civilization is under threat. We dont need any big brother who is blind in greed and selfishness. The more you give the more they want. Wake up. Sign the petition in Change dot org and let the world hear us. Now as a Keralite, it boils our blood to read the above comment. Well, I should say that's what every Keralite would be thinking(and I believe the local Tamilians living around Mullaperiyar as well). I do not know how true the effects of the disaster would be. Its hard to believe that 4 states would no more exist if it happens. But we do know one thing - when others recommend Kerala to prepare for disaster management, we will keep pushing on our demands for a new dam, and making the existing one safer. That's all we can do, and that's all what makes sense. I do not know what to believe. But I know one thing, people have panicked - the thought of the disaster shudders them, but they have no option but live as any other day. I would say we start panicking when the top Politicians, Celebrities, and Other important personalities start moving out of these districts. Till then - its just another day. 1. The dam was built with an outdated technology. Infact the only existing dam in the world that was built with that technology. 2. The dam is more than 100 years old. 3. 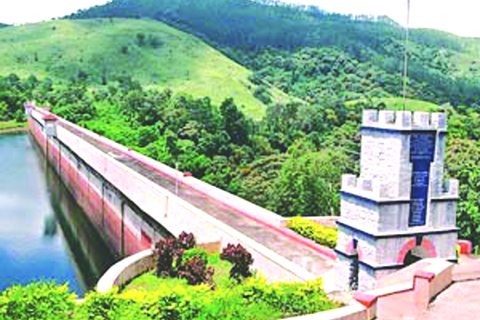 The dam is situated in Kerala. The river is situated in kerala. 4. The dam is owned by Kerala. As per an agreement it is operated by Tamil Nadu. 5. The water harnessed through the dam is used exclusively for the benefit of the neighbouring state, Tamil Nadu. Electricity generated through the dam is also consumed exlusively by Tamil Nadu. 6. There has been not a single incident so far in more than 100 years wherein the dam was shut down by Kerala (or erstwhile Travancore) to deny water to the people of the five parches districts of Tamil Nadu. 7. There have been seismic termors recorded in recent times in and around the location of the dam. 8. Experts from IIT Kharaghpur and IIT Delhi have submitted their fears about the degrading strength of the old dam and its increasing vulnerability. If Kerala has not acted irresponsibly so far (if anything, it has acted generously all these years), why must its fear about the safety being dismissed by Tamil Nadu off hand as some diabolical plan to deprive Tamil Nadu of water. Kerala has emphasized time and again that they believe in 'Water for Tamil Nadu,and security for Kerala'. Kerala has stated that Kerala will undertake all expenses to build a new dam at a nearby location BEFORE decommissioning the existing dam. All existing commitment to continue supplying water to Tamil Nadu will continue to be honored. 10. 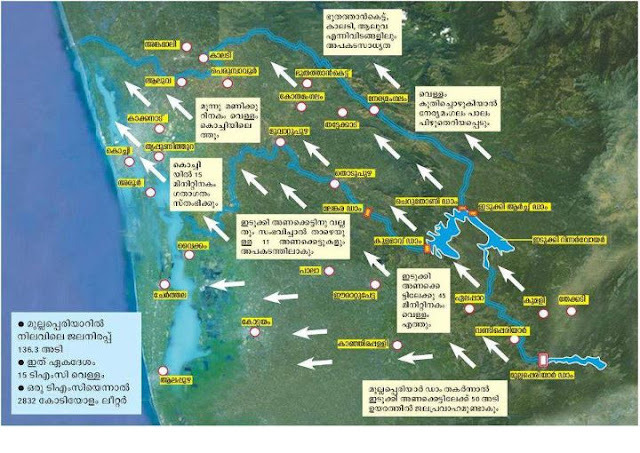 If the dam breaches the calamity will not only wash away a large chunk of kerala into the ocean, it will also destroy the entire dam as it stands today, and along with it THE AGREEMENT TO distribute the water harnessed through the dam to Tamil Nadu. While TN people and politicians want to stonewall any discussion on building an alternate dam, that new dam may actually be in TN's best interest. Built with modern technology, materials, world class specification, and anit seismic standards, the new dam could last for centuries if not millenia. If nothing is done and the existing dam bursts, Tamil Nadu's hopes of continuing to live off of Kerala's waters, would come to an abrupt end. 11. If the existing dam bursts and a huge humanitarian calamit ensues, the public opinion against a dam would be so strong to begin with. Next, the position hereto adopted by Tamil Nadu people and politicians would be viewed as totoally insensitive, inhuman and thankless by the entire world, and particularly the people of Kerala. Any suggestion to build a new dam over mullaperiyar after the death and destruction of Keralites, would be scoffed at by one all oll, except Tamilians. 12. It is in the best interest of TN, that the people and politicians of Tamil Nadu tone down the rhetoric and meet and match Kerala's goodwill midway. In my opinion it is extremely kind of Kerala to volunteer to take the entire bill for the new dam. Ideally, TN should step us and be willing to foot half the expenses. It may be a good idea for TN to foot the entire bill for the new dam, as a token gesture to acknowledge and thank the goodwill of Kerala to allow Tamil Nadu the exlusive use of Kerala's waters through the dam at Mullaperiyar. Social Networking, now its Microsoft's turn?